Updated River Run Condo - King Bed - Slope Views - Great Rates! Updated ski condo at the beautiful Keystone Resort in CO. Our 1 bedroom 1 bath condo at The Silvermill Lodge in the heart of River Run Village sleeps 4 and is only steps away from the Gondola. Enjoy slope views, a king bed, HD Cable TV, FREE wifi, and updated finishes including granite counters and stainless steel appliances. The Silvermill lodge features FREE underground parking, elevator access, 3 onsite hot tubs, sauna, a relaxing lobby with pool a table, private ski lockers and access to the River Run Village pool. Reservations booked more than 30 days prior to arrival require a non-refundable $250 reservation deposit. The balance is due in full 30 days prior to arrival, Reservations canceled 30 days or less prior to arrival are 100% non-refundable. 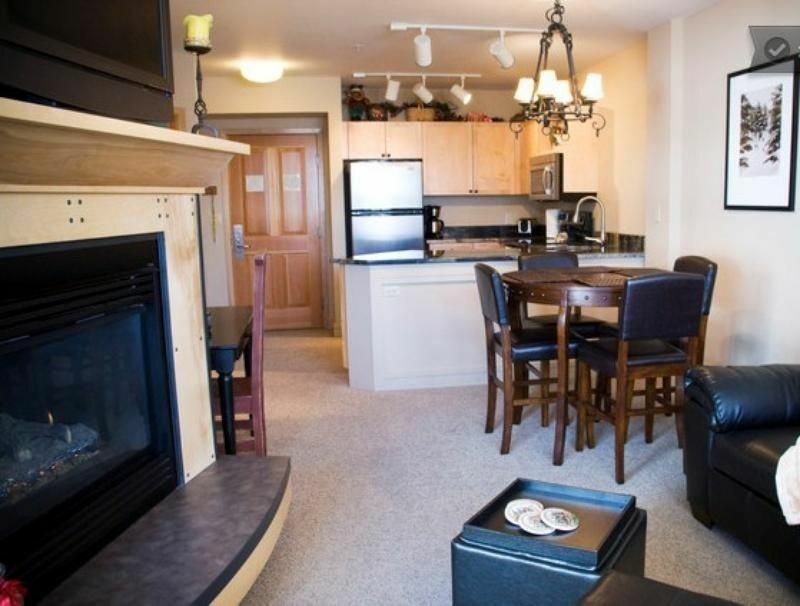 This condo is locally and professionally managed by Book by Owner Park City. Book by Owner will prepare your accommodations, provide arrival instructions and will be available during your stay should you need additional assistance to insure an enjoyable stay in Park City. We look forward to your arrival! Silvermill is in the heart of River Run Village and just steps to the gondola as well as all the shops and dining / bars in River Run Village. Our condo has a unique location at the end of the hallway which provides peace and quiet during your stay. The condo also overlooks the courtyard of Silvermill sheltering guest from some of the noise and commotion of River Run Village. Come and enjoy your stay at Silvermill! This was our first visit to Keystone and the location of this condo does not disappoint! It’s on the end of the hall - which means relatively quiet - but also the very farthest/walk from the elevator. It’s also tucked into a quiet courtyard so there’s minimal noise from outside. The mattress on the pull out couch was very comfortable and fine for either kids or adults. The king bed was large and while comfortable, the bed springs are loud when sleeping/turning. Unit is outfitted great with dishes etc! We did have a fire alarm go off right as we were putting the kids to bed one night and had to evacuate. A ‘resident’ says it happens occasionally as someone likely forgot they had something in the the oven :-) All in all a great trip! Clean and nice condo. We had a great time skiing over spring break. Lockers were very handy. I grilled by the hot tubs and that was convenient and worked well. Condo was stocked well. Even the sofa bed has a decent mattress and that is uncommon!!! Mike was amazing, very responsive and took care of us when we had a special request for late checkout. I will absolutely stay here again. Thanks so much for sharing your review. So pleased to hear you enjoyed the condo and had great visit to Keystone and Silvermill. We look forward to hosting you again soon! We enjoyed our time skiing at Keystone and this vrbo served us well. We had a great experience being right around the corner from the lifts. We had everything we needed for a long day skiing. Convenient ski lockers, hot tubs, covered parking, and a comfortable bed. 10/10 would recommend anyone to stay here. Super convenient. We came in late and check in was easy. Thank you for sharing your review of our Silvermill condo, great to know you enjoyed your stay and look forward to hosting you again in the future. Silvermill Lodge is in the heart of River Run Village and less than a one minute walk to the gondola. You'll find activities on the mountain and in the village during any season. Reservations booked more than 30 days prior to arrival require a non refundable $250 reservation deposit. The balance is due in full 30 days prior to arrival, Reservations cancelled 30 day or less prior to arrival are 100% non refundable.